Bryant Products has the answers to your conveyor component design problems and needs. 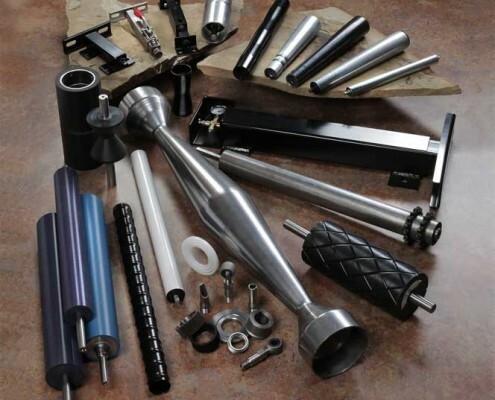 If you are looking for superior designs for the roller, pulley, takeup, and friction coatings used in your systems, look no further. We are a collection of creative, knowledgeable, and talented individuals focused on the design and production of conveyor components and custom products and coatings for industry. Bryant’s staff has years of experience, education, and ongoing training to ensure that when you contact us for assistance, we are able to provide a roller, pulley, takeup, or special fabrication designed for your application. We have standard Telescoper® brand takeup sizes in stock for same day shipment and are able to ship most takeup customizations within 2 weeks. We offer a full line of conveyor rollers and pulleys built to your specifications – no more buying off the shelf and needing to modify your existing conveyor to fit the pulley. In a hurry? We have an expedite program, Rapid Response, for custom rollers and pulleys to make sure you are up and running quickly. We engineer solutions to the problems they ignore. When the status quo is not good enough – call us. We can solve your problems and help you advance your technology.